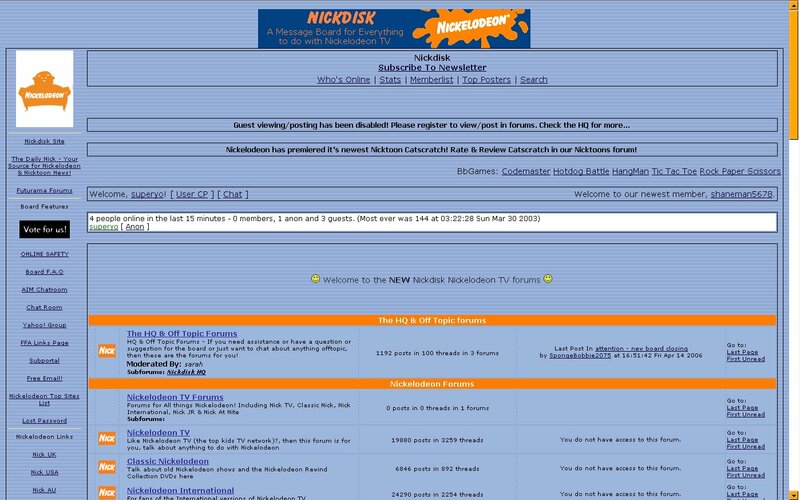 Nickdisk board was started on May 19, 2001 on EzBoard and is one of the most popular Nickelodeon fan boards. Members can post, chat, and whisper. After two hacking attempts, the board officially moved to BbBoard on March 4, 2002. Thanks to the BB team, we were able to restore all our messages to the new board. The board was mostly hosted on one of the BB server : "Emerald"
Due to the increasing of NickDisk board popularity - we had more than 200'000 messages in more than 20'000 threads - we had to move to BbBoard version 2 in July 2005. This new version was rented. 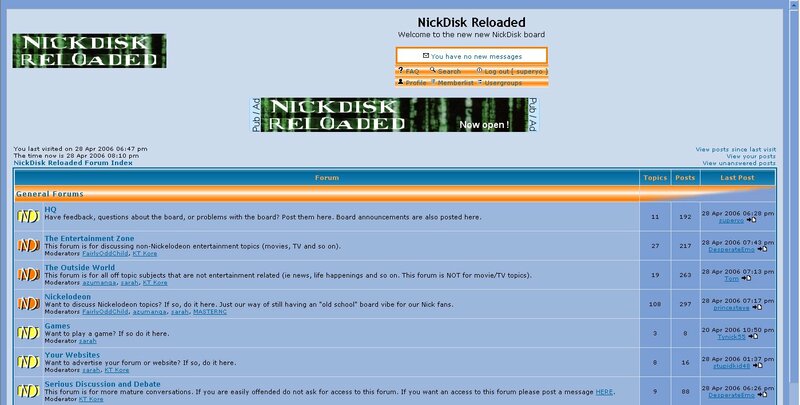 On April 13, 2006, the old NickDisk board closed. We had nearly 11000 registerered members 240'000 messages and 26'000 threads before we move. Unfortunately, we lost all the registered members and messages. The new Nickdisk board is now called NickDisk Reloaded and use the famous open source board : PhpBB. It is hosted on Nuxit servers in Paris (France). 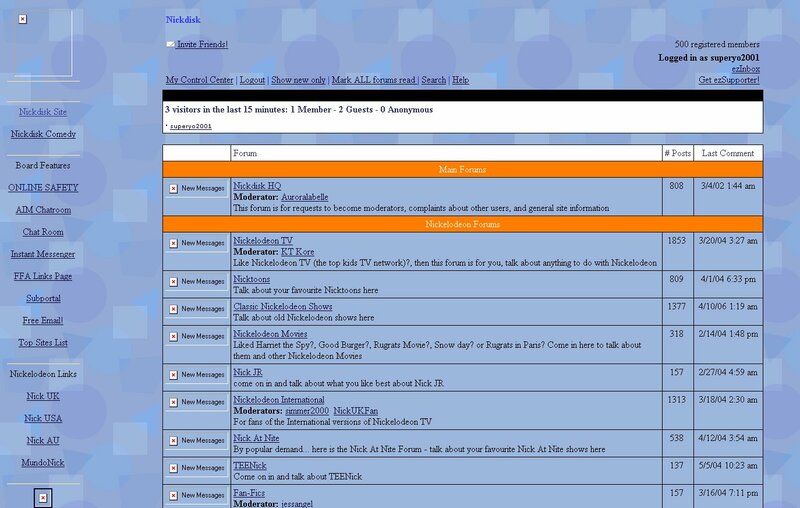 Most global forums are here, however, all Nickelodeon forums are now mixed in one. ohhh. wait, what? you can't just put it on the same post? blah, forget it i have heat stroke. So...it took you a week to say that...??? it was the first time i saw it lol. ok superyo i think i get it now. Why guest viewing was disabled on the emerald board? put how blond i am on the history. that's has alot to do with nickdisk. Nickdisk Presents.. The Nickdisk Forums Timeline! 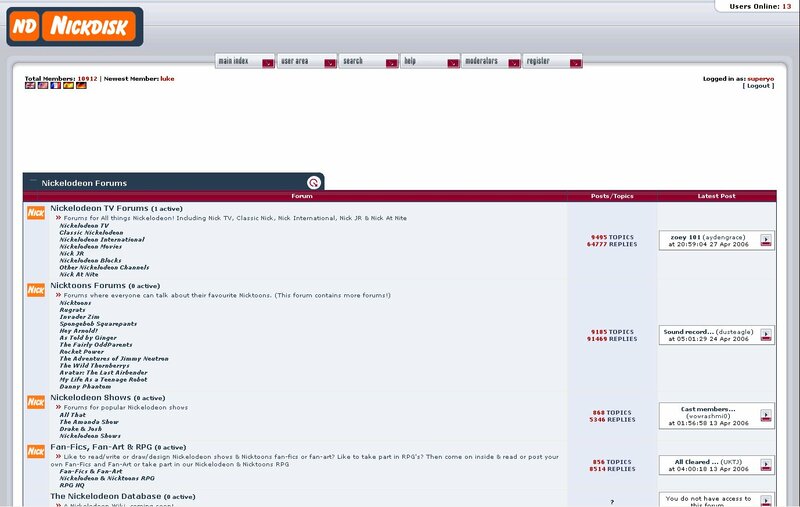 Sunday 17th February 2002 – Tragedy Struck Nickdisk Forums when the board was hacked and everything was deleted. Monday 22nd April 2002 – Nickdisk.co.uk opens! Wednesday 5th March 2003 - MTV Networks (MTVN) threatens legal action against Nickdisk (site and board) due to links to sites that offer episode downloads being posted.